The cast of the Hardline Productions presentation of Bright Blue Future. Photo by Mark Halliday. 20-something angst gives way to an exploration of morality in Sean Harris Oliver’s Bright Blue Future. As a morality play, Bright Blue Future is solid. While I was expecting something different, it turns out that was probably a good thing. 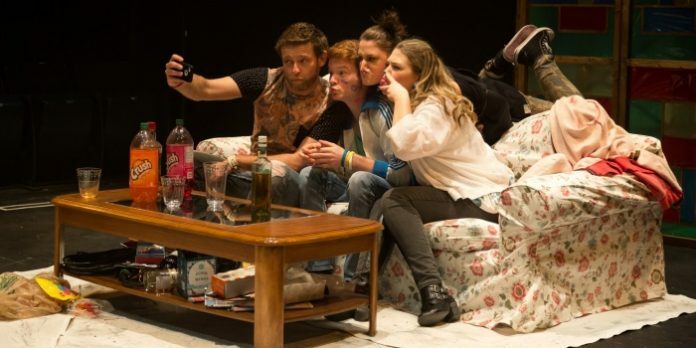 Talk with the playwright and director and you are left with the distinct impression that Oliver’s play is all about how 20-something’s view their place in the world, with few job opportunities, no possibility of home-ownership, all under a cloud of unprecedented debt. But while Oliver does touch on these issues, Bright Blue Future is much more than a bunch of millennials whining about their lot in life. Taking place over the course of one night, Bright Blue Future tells the story of four friends who return from a heavy night of clubbing, and even heavier drug use. The party is only getting started though, as the booze and drugs continue to flow at the home of Arianna and Alexandra, a lesbian couple with relationship problems. Joining them is Arianna’s BFF Carston, the gay former male model who is desperately refusing to let go of his twenties, and Josh, the cute young party-boy still trying to figure out who he is. When a foray into the bedroom leaves one of them on the floor in their own puke and seizures, the remaining three must come to terms with consequences that are infinitely more far-reaching than worrying about money, or living up to your parent’s unattainable expectations. The real strength of Bright Blue Future comes in asking just how far we are willing to go to save ourselves. Here that question is more akin to the drunk driver fleeing the scene of an accident. The answer to the big question of the night though is not as satisfying as it could be, given these characters are already largely morally bankrupt: Alexandra is housebound by a monitoring bracelet, Carston is on the run, and Arianna is lying for financial gain. The only one with a shred of possibility is the young Josh, but he spends most of the second act incapacitated. Even as the one choice Alexandra, Carston and Arianna must make is bigger than all of their past transgressions combined, there is little sympathy generated for the trio. The stakes may be high, but without a connection the shock and outrage we should feel never matches the potentially life-altering deed. The playwright’s penultimate scene doesn’t help either, as Arianna’s attempt at redemption is oddly focused on something other than what has just transpired. While we may not be fully invested in these unsympathetic characters, the quartet bring some nice performances to the stage. As Carston, Dmitry Chepovetsky fights against a stereotype of the flamboyant gay with a little too much “honey” and “girl” in his vocabulary, but the variety in his delivery keeps us interested. As the lesbian couple, Genevieve Fleming and Rachel Cairns find a nice balance between the conflict and love in their relationship, and Curtis Tweedie as young Josh is bright-eyed and open. Under Shawn Macdonald’s direction the always difficult alcohol/drug stupor is executed with skill. Never an easy space to design for, Jenn Stewart’s stain glass pedestals on two sides of the Pacific Theatre’s traverse stage felt more akin to the theatre’s church location than the play’s story. Lighting designer Jill White gets to have fun with some nice results, and Matthew MacDonald-Bain’s sound design puts us inside the club. Bright Blue Future by Sean Harris Oliver. Directed by Shawn Macdonald. A Hardline Productions presentation on stage at Pacific Theatre (1440 12 Ave East, Vancouver). Visit http://pacifictheatre.org for tickets and information.